Solar Powered Wooden Helicopter | OhGizmo! Even when surrounded by more technology than one person really needs I still have a soft spot for wooden toys. It probably has something to do with their simplicity. No batteries to recharge, no drivers to upgrade and no dead pixels to deal with. (I’m looking at you DS Lite!) And most importantly they require kids to use that imagination that’s locked away somewhere in their brains. But enough of my nostalgic rant. It seems the once simple wooden toy is starting to get some fancy upgrades. 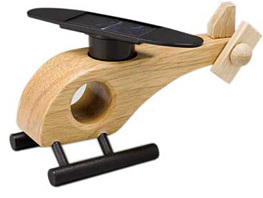 This wooden toy helicopter has a solar cell located on the top of the rotors that will cause the blades to spin when the toy is placed in a sunny spot. Of course there’s no chance this helicopter will ever get airborn but thankfully no batteries are required either. The Solar Powered Wooden Helicopters are available at Plastica in one of five different colors for $32.00. Here’s a fun little toy for your desk… er… kids. This toy chopper has solar panels built into the rotor, which spins when left in the sun. Available in a few different colors, you can pick it up here.